Most murders within the human species have been committed by soldiers in war. Though it remains a matter of debate whether the potential for warfare is lodged in genes, culture, or both, humans are the only creature that intentionally kills its own kind for reasons of religious, economic, or political ideology. Although war has been a near constant in the human condition (estimates are that over the last 3,500 years there have been only 230 years of peace throughout the civilized world), it is the past 100 years that will undoubtedly be remembered as the military century. Of all war fatalities over the past half millennium, fully three-quarters occurred during the twentieth century—including roughly 26 million in World War I and 53 million in World War II. War is certainly one of the primary driving forces behind cultural evolution. Its history features the increasing lethality of its instruments as well as shifts in acceptable target populations. Primitive warfare was highly ritualistic, often with checks to ensure the killing did not become too efficient and with casualties limited to the group's most expendable segment: young males. Such conflicts in hunting-and-gathering societies often entailed little more than demonstrations of courage and occasional expropriations of another group's food, women, and children. With the evolution of social organization, the stakes increased, along with the potential for mass killing. Armies of trained warriors numbering in the thousands were fielded thousands of years before the birth of Christ. Whole peoples were slaughtered by the Assyrians, Scythians, and the Huns under Attila. In the thirteenth century, the Mongols brought a reign of terror to central and western Asia, where entire populations of conquered cities were systematically massacred. Genghis Khan led the slaughter of an estimated 40 million Chinese to open the northern part of that country to nomadic herding. With the advent of total war, genocide became a strategic goal. Nevertheless, the heroic individual could still emerge from the mass of slaughter, and there was still contact, however bloody, between warriors and their victims. Over the past 500 years, international affairs have been largely shaped by European and American innovations in military technologies and strategies. From the sixteenth and seventeenth centuries on, wars of religion and territorial grabs were to be transformed into wars of nationality. To protect "national interests," each state had to maintain a military balance of power with other states. The Napoleonic era was notable for upsetting this balance through its exploitation of modern nationalism. The entire French civilian population was mobilized for war, producing a force so potent that it overran most of Europe. Never before had the world seen anything approaching the scale of mass war in 1812, when Napoleon entered Russia with a half a million soldiers and a thousand cannons. Yet, as Napoleon's failure in Russia showed, strategy combined with individual and collective valor still could overcome the numerical superiority of an enemy in an era that still featured cavalry attacks, infantry assaults, battle cries, and hand-to-hand combat. Industrialization, technological innovation, and the strategy of mass war combined to relegate the heroic warrior to the annals of the past. During the U.S. Civil War, attempts to combine the Napoleonic tactics of charging in mass formations with the new factory-assembled instruments of death—specifically, breech-loading rifles (propelling bullets ten times farther than the muskets used by Napoleon's troops), land mines, and hand-cranked Gatling guns that fired 350 rounds a minute—led to the slaughter of more Americans than two world wars and the Korean and Vietnam conflicts combined. When Europeans turned their Maxim machine guns on each other in World War I, the individual soldier was reduced to an interchangeable, impersonal cog of massive industrialized killing machines. No Achilles or Hector could brave attacks originating from hundreds of feet beneath the sea or from thousands of feet in the air. Before the outbreak of World War II, the bombing of civilians was generally regarded as a barbaric act. As the war continued, however, all sides abandoned previous restraints. War economies had to be created to support the millions on the front, employing women and the aged to replace the missing men. With so much of the population integrated within an elaborate wartime division of labor, distinctions between combatants and civilians were increasingly blurred. Aerial attacks on the great cities became standard strategy early in the conflict, carried out by bombers and later by Germany's unmanned V-1 and V-2 rockets. The war ended with the obliteration of Hiroshima and Nagasaki by atomic bombs; the crews brought about the death of over a third of a million Japanese civilians. 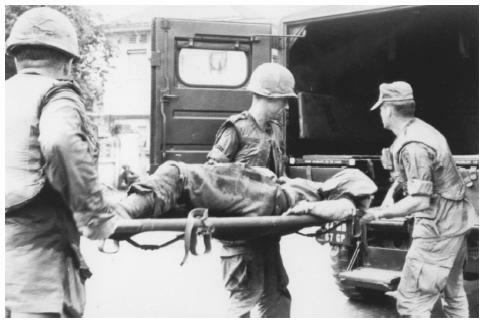 American soldiers move the body of a comrade who died in the 1968 bombing of the United States bachelor officers' quarters in Saigon during the Vietnam War . Since World War II, the rule that soldiers should only kill other soldiers when in face-to-face combat also evaporated as civilians were increasingly drawn into the frays. In Vietnam, Americans killed unarmed women and children. Nearly 40 percent of the Panamanians killed in the 1989 U.S. Operation Just Cause invasion were civilians, as were three out of ten Croatians killed by Yugoslav Army and Serbian troops in 1991–1992, and over six out of ten casualties in Bosnia. The percentage of war-related deaths comprised of civilians increased from 14 percent in World War I to 67 percent in World War II to 75 percent in conflicts of the 1980s to 90 percent during the 1990s. The twenty-first century began with the potential for nuclear, biological, and chemical holocausts. Despite the massive needs of the world community, governments continue to spend nearly a trillion dollars a year designing and perfecting the means by which to kill one another's citizens. The arms industry remains the world's largest manufacturing industry. Worldwide, for every dollar currently spent per pupil for education, twenty-five are spent per soldier. Postmodern warfare also features a reversal of past trends toward total war and deindividualized warriors. With the end of the cold war, military conflicts are no longer the preserves of nation-states but rather increasingly involve terrorists such as al Qaeda's mastermind Osama Bin Laden, crude paramilitary forces, and cruel clashes between ethnic and religious groups. The early twenty-first century was an era when a single individual could produce a strain of lethal bacteria or a chemical weapon capable of decimating an entire city. Ironically, the modern West's high-tech culture has bred a complacency about risk that has combined with the dense interdependencies of society's parts to render the most advanced societies especially vulnerable to disruption by an attack on only one of its parts—as when a computer virus is unleashed, a water supply infected, a power grid disrupted, or office buildings obliterated in kamikaze attacks by hijacked commercial jumbo jets. Crossette, Barbara. "UNICEF Report Sees Children as Major Victims of Wars." New York Times, 11 December 1995, A7. Dyer, Gwynne. War. New York: Crown Publishers/Media Resources, 1985. Keegan, John. A History of Warfare. New York: Knopf, 1993. Moyers, Bill, David Gruben, and Ronald Blumen. "The Arming of the Earth." A Walk through the 20th Century with Bill Moyers. Washington, DC: PBS Video, 1983. Videorecording. Toynbee, Arnold. War and Civilization. New York: Oxford University Press, 1950.